"Never Fall in Love with a Stock"
Somebody said “never fall in love with a stock” but nobody said “never fall in hatred with a stock”. If I find out a biotech company with stupid science basis I usually short it. Especially if stock already heavily pumped by famous analysts. Fortunately there are not so many small biotech companies based on dumb science. May be the "natural selection" of the free market eliminates them very soon. But it seems like that some of them are almost invincible and could "resurrect" after multiple falls. By the way the ancient Egyptians were crazy about to preserve their bodies after death. They were sure (or somebody suggested them this strange idea) that it will help them to resurrect. Well, may be they were right and science of not far away future will resurrect some of them by using their complete genome extracted from their preserved bodies (mummies). May be the stem cells technology will be useful for this mission. Let talk about biotech Osiris and its approach to use stem cells tool. There are many small biotech companies that focusing on using stem cells to cure numerous diseases. Sure that some of them have a very bright future. Stem cells are likely to the universal tool that can be used to repair or regenerate multiple human organs and tissues. For example, it’s already reality that Stem Cells Used To Grow a New Tooth Inside a Mouse's Mouth. 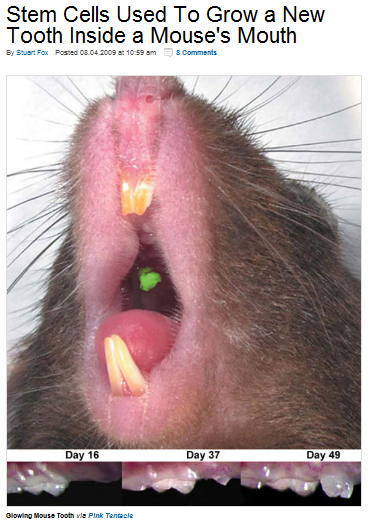 A mouse in Japan has successfully regrown a lost molar from a genetically engineered tooth seed. Essentially composed of tooth stem cells, the seed grew into a fully functional tooth after only about a month and a half. The new tooth works far better than an inorganic implant, because it contains the same nerves and vascular connections as a natural tooth. As seen in the picture above, it has the additional optional feature of glowing green under ultraviolet light. The scientists created the seed by placing a mixture of multipotent cells, a less variable type of undifferentiated stem cell, into an organ culture for a week. Once the ball of cells began to differentiate, the scientists surgically implanted the cell seed directly into a hole in the mouse's jaw. After that, the tooth was on its way. Well, every new technology is started from animal testing. With the technique perfected, its easy to imagine the dentist forgoing the drill and simply smearing a tooth stem cell concoction over a cavity, letting the tooth regrow itself. Different companies are using this tool (stem cells) by different ways, sometime very complicate. CYTX: Cytori developed the Celution® System to deliver a clinical grade population of such cells rapidly and reliably at the point-of-care. CUR is utilizing its patented Human Neural Stem Cell technology to create cures for diseases of the CNS (central nervous system). The company’s technology allows for the isolation of CNS stem cells from tissue; the expansion in vitro of each cell up to a billion billion times (60 doublings); and the controlled differentiation of the cells into mature, physiologically relevant human neurons and glia which can be used to treat CNS diseases and conditions. Then these cells are injected (transplanted) in the injury site for Treatment of Neurological Disorders or spinal cord damage. GERN is intending to use human embryonic stem cell technology to enable the development of transplantation therapies by providing standard starting material for the manufacture of therapeutic cells and facilitate pharmaceutical research and development practices by providing cells for disease models and screening. Thus, almost all stem cells biotech are trying to deliver the stem cells to appropriate place i.e. organ or tissue where they will be useful. Prochymal®) have demonstrated anti-inflammatory properties, and they can prevent scar tissue formation and regenerate specific tissue structures, making them potentially useful in a wide range of conditions. Well, good start, what is next? OSIR two attempts are already failed: Crohn's disease and GvHD are already failed. But Osiris is resurrected from both falls. Next results are for type I diabetes: "PROCHYMAL® (Human Adult Stem Cells) for the Treatment of Recently Diagnosed Type 1 Diabetes Mellitus (T1DM)"
The purpose of this study is to establish the safety and efficacy of multiple administrations of PROCHYMAL® in subjects recently diagnosed with type 1 diabetes mellitus. It seems like that some biotech investors are waiting this trial results and buying OSIR now: pps grows from $7 to $9 during last 5 days. Well, I see now that it's very good time to short OSIR. The stem cells are a perfect tool but any tool even perfect one need the skilful hands. OSIR used this tool in the most stupid way. Prochymal will not cure any disease because the stem cells are not delivered in appropriate site. Do you want a new tooth? Just get an IV injection of Prochymal. Our "smart" stem cells will find out what tooth you loose and they will grow a new tooth inside of your mouth. Do you believe in this? I'm not, and I will just short OSIR at high: $9 or $10 will be good for it. Disclosure: I have long positions in GERN now, will open short positions in OSIR at $8.50-9 range. OSIR Feb 19 2011 7.5 Puts (last $0.60) are also good option for OSIR game. Current OSIR products ​​Grafix® (that has been shown to help close wounds quicker than standard care wound treatment) and TruSkin™ (split-thickness, cryopreserved human skin allograft that accelerate a healing of large, chronic wounds) are very good products and their sales will grow. So, I put Osiris in my BUY list as very promising biotech. Last ​​update for OSIR (Osiris Therapeutics could be delisted from Nasdaq in March) was issued just with one goal: to scare OSIR holders and potential buyers. Why OSIR management will do such stupid thing as not issuing of financial statements for 2015 and 2016 before March 2017? According company's estimates product sales were very good in 2015-16 and can show growth >50-70% during last 2 years. Also they have promised some new products in 2017. So, most likely OSIR will publish financial statements before end of this year or in Jan-Feb 2017 and pps will jump at least +100% (from current $5 to $10-12). BTW, one on the reasons that I have changed my opinion about OSIR was their refusing to promote their stupidest product "PROCHYMAL® i.e. 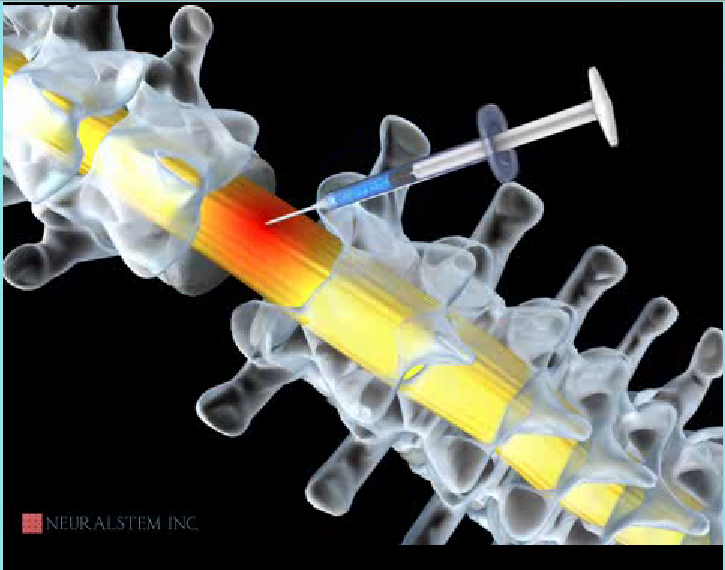 IV injections of stem cells. Current and future OSIR products are produced from human tissues and showed high efficacy in wound healing. Sure that doctors and patients will like them.